This means all actions which express aggressive behaviour as threats, but also the aggression itself, where they really attack. 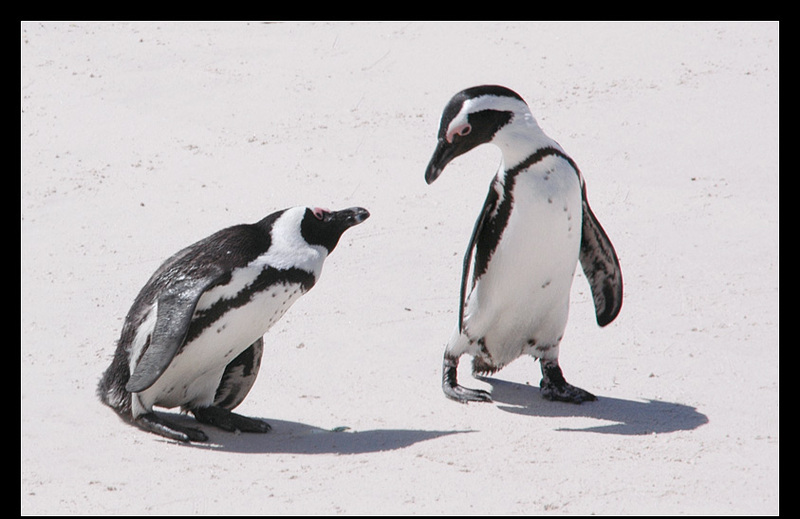 It includes the interactions between penguins of the same species which compete for a possible partner or a good nesting place, but also the threats and defensive actions against another penguin species, neighbouring animal or even predator. When it is just a threat, the opponent can either decide to react or just ignore it and walk on. When it is a real attack, he/she has to react either to fight back or run away. This behaviour can be observed the whole year through (when on land) and isn't necessary directed to one single opponent, but can be aimed against a group, like neighbours around the nest or passing by birds of the same kind. Staring can be unilateral (sideways) or alternating, and either standing or lying down. 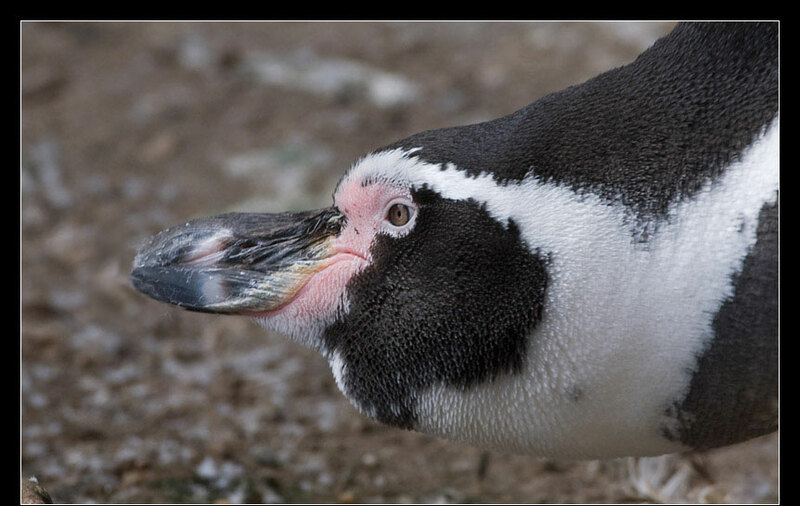 Penguins don't have a depth of focus (binocular vision) and have to focus either with one eye or the other, but never with both eyes at the same moment. Unilateral or one-sided staring (see picture on the left) is less threatening as alternating staring, but both have the same purpose: warning the opponent that he/she comes too close and is regarded as a threat. Often it is part of the breeding behaviour, as a defense of the nest or chick. 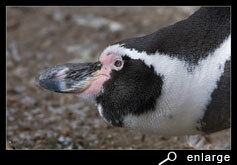 Alternating stares, as shown by the humboldt penguin on the right picture, is more intensive and threatening. The bird will in turn focus with one or the other eye on the opponent, which comes too close. Turning its head, showing its cheek. The feathers on the cheek are sticked up to underscore the black and white pattern. The bill can be pointing forward as a threat. This is even more threatening while the stares are combined with a pointing of the bill toward the opponent. It's a threat not to approach closer, because otherwise an attack could follow. Often they emits a loud, growling sound. As soon as the opponent comes in range, a beaking fight will follow. 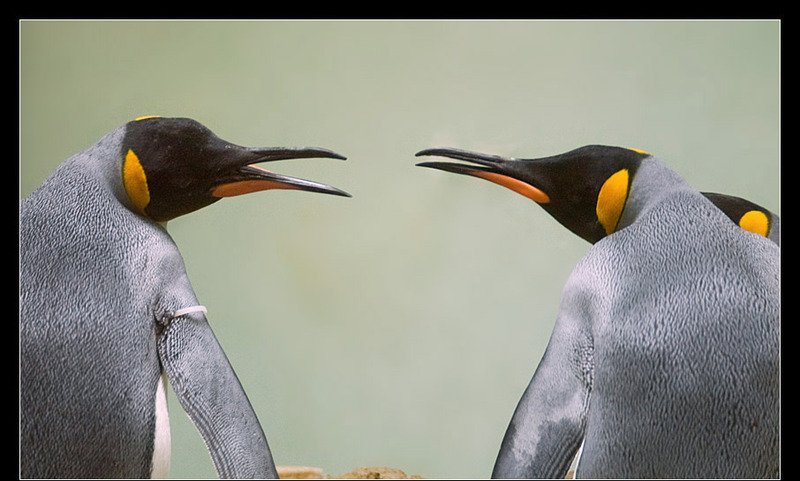 Both lean forward and upwards, open their bill and hit each other with their bills. To protect their eyes, they squeeze them half. 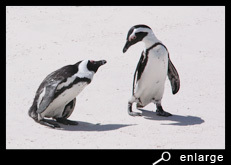 Such fights are normal practice with penguins which breed close to another in large colonies. 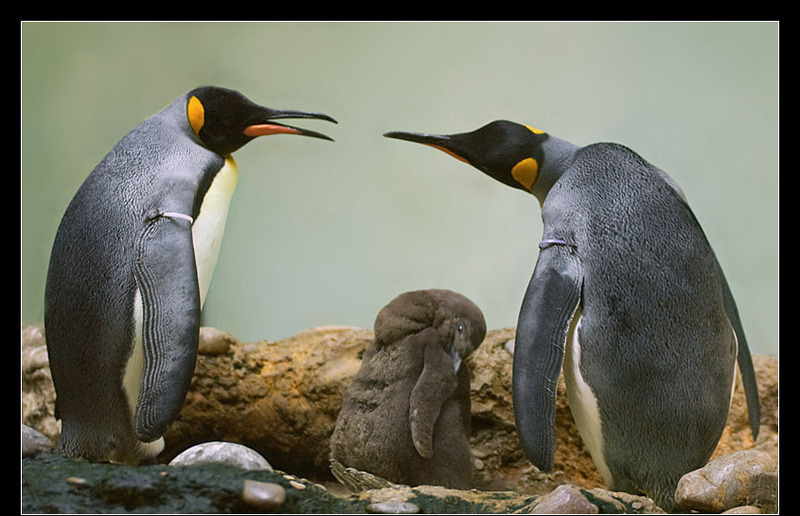 While the distance between different breeding pairs is small, they often have to defend their nesting place and chicks against passing birds coming and going to feed their own chicks or alternating a breeding shift. 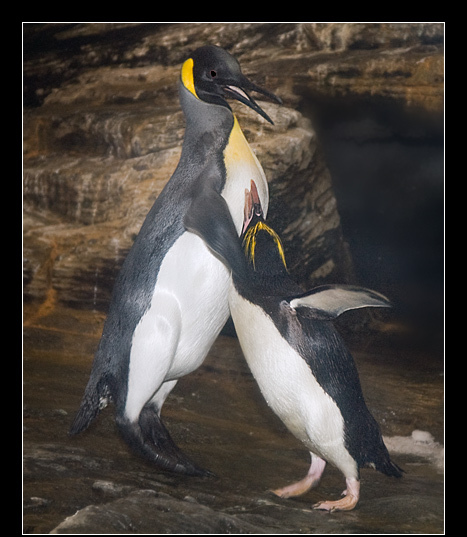 On the picture you see a macaroni penguin attacking a king penguin, who blocked the way. 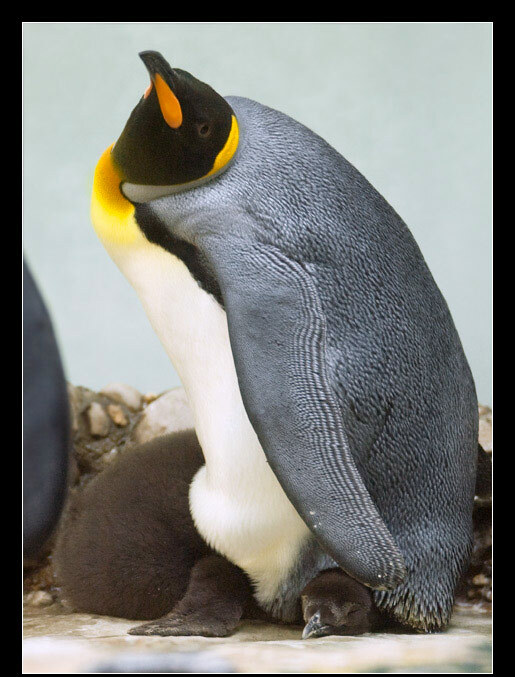 The bird leans forward, extending its wings and opening its bill, while it locomotes toward the other penguin. 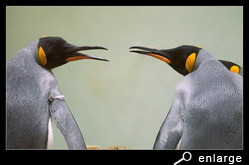 On the picture is was an attack between two different species in the zoo, but it often happens between two birds of the same kind. The attack may be silent or can involve general squawking. 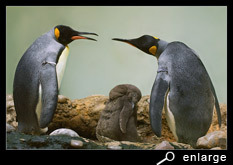 A breeding penguin with eggs or chicks, of course, will not leave its nest.